The 10-day festival of car shows, galas, tours, and parades culminated with the 35th annual races held at Schenley Park. Nearly 150 vintage race cars participated in this year's Pittsburgh Vintage Grand Prix, grouped into six different race classes along with two featured races. The event began in 1983 as a one-day race and since that time it has become the nation's largest vintage race event and the only one still run on city streets. It is the work of enthusiasts and a plethora of volunteers who work tirelessly to make sure the events run smoothly and safely. Funds and donations are raised at each event, with proceeds benefitting the Autism Society of Pittsburgh and Allegheny Valley School. It seems that rain and/or extreme heat are staples of the PVGP. This year, several of the events were either rained out or saw low attendance due to the rain, including the Walnut Street Car Show and the Waterfront Car Cruise. However, the weather during the Schenley Park races were absolutely blissful, prompting some of the largest crowds of spectators to linger and enjoy the many car shows and vintage racing. New this year was the 'Passport to Elegance' Jet Center Party at Allegheny County Airport's Voyager Jet Center hangar. Gala-goers were able to dine on international delights while being surrounded by vintage cars and airplanes. The event joined the Blacktie & Tailpipes Gala, PVGP Historics, Invitational Car Show, Waterfront Car Cruise, Downtown Parade & Car Display, Grand Prix Tune-Up, and more. 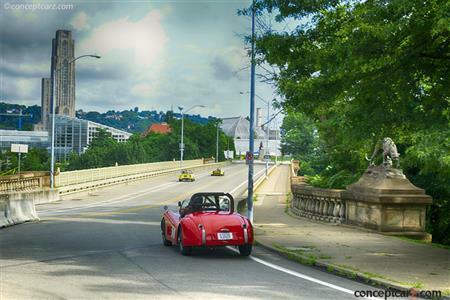 The 456-acre Schenley Park offers ample room for the thousands of show cars that show up on race day which adds to the allure of the PVGP. As enthusiasts walk the well-manicured hills, the vintage race cars can be heard in the background during the practice, qualifying, and racing sessions. The 2.33 mile circuit offers many great viewing locations for spectators. For the drivers, the 23 turn course offers many exciting challenges, including stone walls, curbs, telephone poles, Jersey barriers, hay bales, and manhole covers. It is a scenic course with century-old walls, Phipps Conservatory and Botanical Gardens, fountains, and monuments. The course tests both the drivers and the cars abilities, with long and fast straight stretches, grueling hills, and switch-back curves along Serpentine Drive. To the winner goes the bragging rights along with well-deserved admiration from their fellow racers and enthusiasts. The 10 day festival began with the Kick-Off Rallye which saw more than 70 teams partake in the challenge. The event has been descrived as a countryside tour and a scavenger hunt rolled into one. This was followed by the Black Tie & Tailpipes Gala. This annual event was held for the first time in Fox Chapel's Pittsburgh Field Club. Over 300 guests were in attendance who enjoyed a photo booth, silent auction, a sushi bar, and a dinner. The next event was the 14th Annual PVGP Historic Races held at the Pittsburgh International Race Complex. The 2.8 mile race course played host to many historic and modern high-horsepower race cars. The purpose-built track, located 40 miles northwest of Pittsburgh, provides plenty of room and safety features to contain the fast and technical racing of the well-seeded race groups. Subsequent events included the Invitational Car Show on Walnut Street, Waterfront Car Cruise, Downtown Parade & Plaza Display, Grand Prix Tune-Up @ Atria's, Countryside Tour, Jet Center Party, and the Forbes Avenue of Speed – Parade and Driver Reception. The PVGP is a unique event with hundreds of race cars, thousands of show cars, and multiple race related events. It is run on city streets, run and operated by volunteers, and has raised nearly $5 million for local charities. In 2016, a record $405,500 was donated. Next year's event is scheduled to run from July 6 through July 15. This year, the Marque of the year was the Chevrolet Camaro. Next year's event will celebrate BMW.